We’ve seen the tragedy of Australian farmers forced off their land following years of unrelenting drought but few episodes in the developed world can match the devastation wreaked on the Oklahoma sharecroppers during the Great Depression. 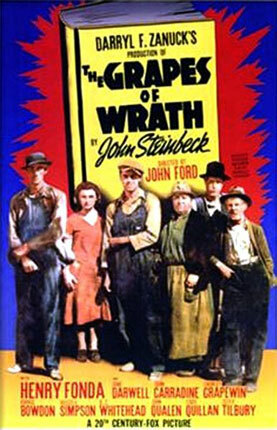 John Steinbeck researched the event for his epic novel ‘The Grapes of Wrath’ which was snapped up by the legendary producer Darryl Zanuck and made into a film the year after its publication. With director John Ford at the helm and Gregg Tolard behind the lens, the film, like the novel, proved controversial, especially with the big Californian farmers and politicians who were implicated in the story. Tom Joad (Henry Fonda) has just been released on parole for manslaughter and returns home to find that the ‘dusters’ have blown away all the topsoil and the banks have sent in the bulldozers to level the farm houses. There is no choice but to hit the road and so, with their possessions piled dangerously high in a rickety jalopy, they set off on Route 66 in search of work picking fruit in California. Old Grandpa Joad (played by the ironically named Charley Grapewin) dreams of leaping into a tub full of grapes and stuffing himself full of the sweet little baubles. But the reality of the promised land is so far from Grandpa’s dream that it’s just as well he never gets to see it. In what is perhaps the films most dramatic scene the family drives through an itinerant camp on the outskirts of Bakersfield passing hundreds of people just like themselves, all desperately seeking employment that simply doesn’t exist, at least not the kind with wages that can stave off starvation. At the end of the film, in what well may have sealed her Oscar win for Best Supporting Actress, Jane Darwell as Ma Joad muses on the fate of men; they succumb to sudden “jerks” in life, she says, whereas women go with the flow. Still, people like the Joads can’t be wiped out; “We’ll go on and on,’ she declares, ’cause we’re the people.” It’s a stirring tribute to the tenacity of the human spirit.